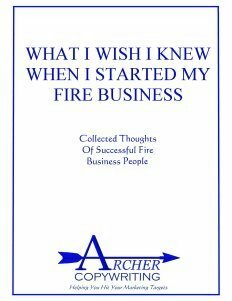 You need the best marketing products you can get to succeed in the competitive fire business, whether as a for-profit or as a non-profit. Archer Copywriting can help you hit your marketing targets with a variety of services, which are spelled out below. Case Studies showcase your customer's success story. They tell how your product or service was able to save homes and lives, protect communities, educate people, either civilians or fire service personnel, or make a firefighter's job easier or safer. They highlight the benefit you provide to your customers and add credibility to your product or service. White Papers are studies commissioned by a business to highlight a product or service the company markets. They can include physical products, such as a home defense unit manufactured by a business or a new pump that can be used by firefighters. They can constitute a ground-breaking study from a nonprofit that demonstrates how the way fires are fought has to change, or that there are better ways to protect communities. In White Papers, your business is front and center, showing how you are making the world a better place! Even if you have the best product or service in the world, if you can't convey the importance quickly and concisely, who will know? Speech Writing is an art as well as a science. Having been trained as a Toastmasters speaker, I've learned that a well-crafted speech can add credibility to what you are offering and win over some who might otherwise be skeptical about the benefits of your product or service. And if you run a nonprofit, there is an even greater chance that you will be called on to deliver a speech to potential donors, to people in your community who want to learn more about your organization, and to share your message with those who might be able to help spread the word. In the age of Twitter, Facebook, and YouTube, Social Media Campaigns are essential to quickly spreading the word about your product or service, as well as a nonprofit's message or study. Social Media can spread the word about your business at an astonishing rate, either for good or for bad. Therefore, it pays to put your best foot forward when dealing with social media. Archer Copywriting can help you do that. PowerPoint Presentations are often the heart of any new product unveiling, commencement of service, or study presentation. With PowerPoint, you can present performance charts, videos of your product in action, and graphical material that demonstrates how your nonprofit's latest study impacts the fire industry. More than one of the PowerPoint Presentations I've prepared has been entered into the Congressional Record, so care in preparing such media can prove to be very important to your company's future because you never know who might ultimately see them! As someone once said 'a picture is worth a thousand words', and so it is with charts and graphs. A well-prepared chart or graph can speak volumes to people familiar with all the catchphrases and educate those who are not. For nonprofits, charts and graphs are the heart of any study and even for-profits often rely on them to condense technical details into understandable form with which to inform customers. Informed customers are more likely to buy a product, engage a service, or fund a nonprofit if they feel they understand the benefits your business provides. Studies have shown that before a potential customer picks up a phone, they will visit the website of a business to check them out. This is doubly true for potential donors deciding whether to support a non-profit. As such, you, the business owner, have to put your best foot forward. If a potential customer is turned away by a website that is not fully operational or that is too disorganized or too complicated, they will never pick up the phone or send an email to complain. They'll just go to your competitor's site to find what they are looking for. I've created many websites for public safety organizations, both for-profit and non-profit. Having been a programmer for three decades, websites are a fun break from other projects and provide a nice melding of my programming, copywriting, and graphical skills. 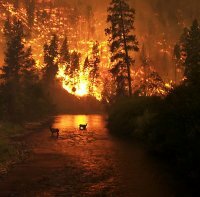 As you can probably guess from the wealth of information contained in my Wildfire News Of The Day newsletter, I come across a good deal of fire-related information. And as some fire-business subscribers have said, this information can be very helpful to their businesses. If you need research done in a particular niche of the fire business, whether to gauge the potential customer interest in an area or to gather facts and figures for a new study, consider checking with me about that. You just never know what sort of information I've come across that could be golden to you!